Olivetol is a naturally occurring organic compound being a precursor in various syntheses of tetrahydrocannabinol. 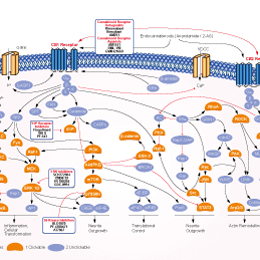 It acts as a competitive inhibitor of the cannabinoid receptors CB1 and CB2. Yangonin is a dienolide kavalactone originally found in Piper methysticum (kava plant) and exhibits neuroprotective, neuromodulatory, and antifungal activities. It activates cannabinoid (CB1) receptors and potentiates the effects of GABA-A receptors. Inhibition of CB1 suppresses the proliferation and migration and induces apoptosis of RCC cells. a Western blot analysis of CB1 protein in RCC cell lines (786-O, CAKI-1, CAKI-2, 769-P, A498, and ACHN) and normal cell line HK-2, and β-actin was used as a loading control for western blot assays. b RCC cell lines were treated at the indicated concentrations for different time points, and the cell viability was analyzed by MTT assay. AM251-induced cell death in 769-P cells in a dose- and time-dependent manner. c AM251-induced cell death in 786-O cells in a dose- and timedependent manner. d AM251 reduced migration in 786-O and 769-P cell lines at 20 and 30 μM concentrations. e The transmembrane cell number of 786-O and 769-P cells after treatment with different concentrations of AM251 significantly decreased compared with untreated control. Otenabant (CP-945598) HCl is a potent and selective cannabinoid receptor CB1 antagonist with Ki of 0.7 nM, exhibits 10,000-fold greater selectivity against human CB2 receptor. Phase 1. CID16020046 is a selective GPR55 antagonist, inhibiting GPR55 constitutive activity with IC50 of 0.15 μM in yeast. It demonstrates weak activity against a broad spectrum of other GPCRs, ion channels, kinases, and nuclear receptor. AM-1241 is a selective cannabinoid CB2 receptor agonist with Ki of 3.4 nM, exhibits 82-fold selectivity over CB1 receptor. AM1241 increased ki67+ positive cells and decreased cardiac fibrosis after MI. A, Masson's trichrome-stained myocardial sections from a sub- group of animals at POD 28. B, Comparison of fibrosis areas in all groups. *, P<0.05 vs. MI group; #, P<0.05 vs. MI+AM group. C, Immunohistochemistry of Ki67 (green), and DAPI (blue) staining in adjacent infarction areas. D, Comparison of ki67 positive cells in all groups. *, P<0.05 vs. MI group; #, P<0.05 vs. MI+AM group. Scale bar, 20 μm. BML-190 is a selective cannabinoid CB2 receptor inverse agonist with Ki of 435 nM, with 50-fold selectivity over CB1 receptor. The effect of BML-190 on DSS-treated Rassf1a +/- mice. DSS-treated Rassf1a+/- mice were given 3% DSS in drinking water for 7 days followed by fresh water for recovery for another 7 days. BML-190 was administrated orally (100µg/g body weight) on days 2, 4, 5and 7. BML-190 did not protect DSS-treated Rassf1a+/- from inflammation induced injury. n=6-10 for all. GW842166X is a potent and highly selective agonist of cannabinoid receptor CB2 receptor with EC50 of 63 nM, shows no significant activity at CB1 receptor. Phase 2. Org 27569 is an allosteric modulator of cannabinoid CB1 receptor, induces a CB1 receptor state that is characterized by enhanced agonist affinity and decreased inverse agonist affinity. (+)-Gallocatechin, found notably in green tea, has moderate affinity to the human cannabinoid receptor and acts as an antioxidant.